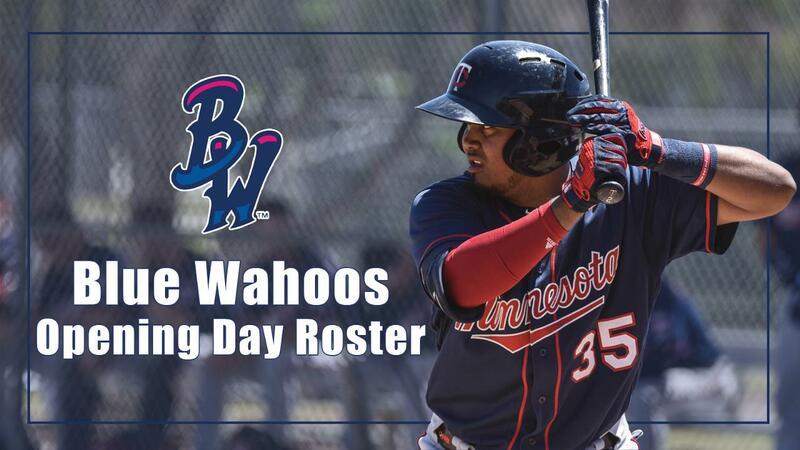 The Pensacola Blue Wahoos will open the 2019 season, their first as an affiliate of the Minnesota Twins, with a roster loaded with top prospect. Baseball America recently predicted Pensacola would have the second strongest roster in all of the minor leagues in 2019, and the recently released Opening Day player assignments back up that prediction. Every night will be a can't-miss mound match-up at Blue Wahoos Stadium, as Pensacola's rotation is stocked with high end talent. Brusdar Graterol, the top pitching prospect in the entire Twins system and the #68 overall prospect in baseball, figures to head the Wahos rotation. Graterol went a combined 8-4 with a 2.74 ERA in 19 starts between A-Cedar Rapids and High A-Fort Myers in 2018, striking out 107 batters in 102.0 innings, combining a fastball that routinely hits triple digits with one of the hardest sliders in the minors, a curveball, changeup, and advanced control for his age. Jorge Alcala projects to follow Graterol in the rotation. The Twins #18 prospect, Alcala was the centerpiece of the Twins prospect haul in their 2018 deadline deal with Houston for reliever Ryan Pressly. With a fastball that has reached 98 mph and a pair of power breaking balls, Alcala averaged 9.4 K/9 in 2018 while posting a 3.81 ERA in 99.1 innings between A+ Buies Creek, AA-Corpus Christi, and AA-Chattanooga. Griffin Jax, the Wahoos projected third starter, will be a fan favorite both on and off the field in Pensacola. A Second Lieutenant in the United States Air Force and graduate of the Air Force Academy, Jax made just 9 appearances in his first two professional seasons due to his active duty military commitments. He resumed his baseball career full-time in 2018, and quickly established himself as a top pitching prospect in the system, posting a 3.70 ERA over 87.2 innings in Fort Myers and a 3.86 ERA in 21.0 innings in the elite Arizona Fall League. The former 3rd round pick enters 2019 as the #23 prospect in the Twins system. Devin Smeltzer will return to Pensacola to open the season after visiting in January to meet fans as part of the Twins Winter Caravan. Acquired from the Dodgers in a 2018 deadline deal for All-Star 2B Brian Dozier, Smeltzer excelled with AA-Chattanooga after the trade, holding a 3.00 ERA over 10 appearances. A 5th round selection in the 2016 draft by the Dodgers, Smeltzer beat pediatric cancer as a youth and has dedicated his career to helping other children in their fight against cancer through his #CatchCancerLooking charity campaign. Sean Poppen slates in as the Wahoos #5 starter to open the year after a strong 2018 during which he posted a 3.45 ERA in 26 appearances with High A-Fort Myers and AA-Chattanooga, striking out 123 batters in 127.2 innings. Tyler Wells, a 2018 breakout start who dominated in Fort Myers (8-4, 2.80 ERA) and then was even better in Double A (2-2, 1.65 ERA), will likely join the Wahoos staff sometime early in the season after a minor injury delayed his Spring Training preparation. The Blue Wahoos bullpen will be headlined by Tyler Jay, the #6 overall pick in the 2015 draft. The Big Ten Pitcher of the Year in his final season at Illinois, Jay transitioned to the starting rotation early in his pro career (2.84 ERA in 13 starts with High A- Fort Myers in 2016), but has since returned to the bullpen where he dominated in college (1.68 ERA, 24 saves in three collegiate seasons). Ranked as highly as the #60 overall prospect in baseball (Pipeline, 2016), Jay looks to build off a 2018 season during which he posted a 4.22 ERA in 38 appearances for AA-Chattanooga. Alongside Jay in the pen will be lefties Sam Clay (5.88 ERA, 34 appearances in AA in 2018), Jovani Moran (9-3, 2.25 ERA, 37 appearances with A-Cedar Rapids and A+ Fort Myers) and righties Jeff Ames (4-1, 4.74 ERA), Adam Bray (2-0, 1.88 ERA, 19 G, A+), Andro Cutura (3.65 ERA, 20 G, A+), Dusten Knight (4-1, 1.71 ERA, 29 G, R/AA/AAA), Ryan Mason (10-3, 2.77 ERA, 39 G, A/A+), and Cody Stashak (2.87 ERA, 37 G, A+/AA). Cumulatively, the pitchers projected to be in the Wahoos Opening Day bullpen combined to post a 2.68 ERA during the 2018 season. In seven seasons as a Cincinnati Reds affiliate, the Blue Wahoos held a team .241 batting average, ranking in the bottom half of the Southern League consistently. That should change in 2019, as the new Twins affiliation will bring an exciting lineup of hitters to Blue Wahoos Stadium. Notably absent from the Wahoos Opening Day active roster is Twins #2 prospect Alex Kirilloff. After hitting .348 with 20 homers in 2018 between A-Cedar Rapids and High A-Fort Myers, Kirilloff enters 2019 as the #9 overall prospect in baseball, but a minor wrist injury sustained late in Spring Training will temporarily delay his start to the regular season. He is expected to return in April. Even without Kirilloff on Opening Day, the Wahoos project to have a potent lineup. Pensacola will carry four players with experience behind the plate to open the season and will likely utilize all four at catcher, first base, and designated hitter. Brian Navarreto, a 6th round pick in 2013, figures to be the primary backstop, having spent all of 2018 in Double-A with Chattanooga, slashing .246/.286/.333 in 97 games. Taylor Grzelakowski will also be a frequent contributor both behind the plate and at first base after nearly winning the 2018 Florida State League batting title and finishing the season with a .298/.370/.458 slash line and 8 home runs. Mitchell Kranson (.256/.332/.351, A+/AA) and Caleb Hamilton (.205/.288/.323, A+), who has appeared at every defensive position in his professional career, will also be in the mix at both positions. The Blue Wahoos infield will be led by Twins #17 prospect Luis Arraez. A career .329 hitter in 5 minor league seasons, Arraez hit a combined .310 with 20 doubles and reached base at a .361 clip between High A-Fort Myers and AA-Chattanooga in 2018. The 21-year-old Arraez will be complimented by 2014 4th round selection (MIA) Brian Schales, who the Twins acquired in an off-season trade. Schales was a Southern League All-star in 2018, reaching base at a .354 clip while knocking 10 homers and 27 doubles for Jacksonville. Last season, Schales slashed .288/.377/.610 against Pensacola, hitting 5 home runs in 18 games. Veteran infielder Drew Maggi, who hit .272 with AAA-Colorado Springs in 2018, and Jordan Gore, a .284 hitter in 2018 with A-Cedar Rapids and AA-Chattanooga, round out the Wahoos infield. Jaylin Davis leads the Pensacola outfield as a dual defensive stalwart and middle-of-the-order threat after slashing .273/.347/.412 with 11 homers in 2018 between High A-Fort Myers and AA-Chattanooga. In centerfield, the Wahoos project to have gritty Jimmy Kerrigan. Signed out of independent baseball in 2017, Kerrigan shot through three levels in 2018, reaching AAA-Rochester for four games and hitting an even .300. Kerrigan hit 13 homers in 2018 and, after a slow start following a call-up to Double-A, hit .292 over the season's final two months. In left, Pensacola will have 23-year-old Ernie De La Trinidad. De La Trinidad hit .311 in 91 games with A-Kane County in the Arizona Diamondbacks system in 2018 before being acquired at the trade deadline by the Twins as a part of a prospect package in exchange for IF Eduardo Escobar. After the deal, he slashed .303/.363/.360 with High A-Fort Myers. Defensive ace and stolen base threat Tanner English will start the season on the injured list, but will add speed to the Wahoos lineup when he returns. An 11th round pick in 2014, English has swiped 102 bases in his minor league career, including 48 over the past two seasons combined. Fans looking to get an early look at the Blue Wahoos team are invited to watch team practice on Tuesday, April 2 from 5:30-6:30 PM at Blue Wahoos Stadium and on Wednesday, April 3 from 6:00-7:00 PM. The Blue Wahoos will begin the 2019 regular season on the road against the Mobile BayBears April 4-8 before kicking off their home schedule on Wednesday, April 10 against the Jacksonville Jumbo Shrimp at 6:35 PM.